Global reach versus currency risk! International stock markets are now as accessible as trading in your home stock market. While some brokers provide access to a range of overseas exchanges, some differentiate themselves from traditional brokers by allowing investors straight-through access to those exchanges. Being able to access international stock markets directly through international stock exchanges allows investors to buy and sell in real time. This is not as important for value investors who are long-term investors. But when you are used to trading directly, the benefits of speed of transaction, transparency and instantaneous reporting are more desirable than going through a broker intermediary. Most international investors use international mutual funds. They provide good diversification but attract high management fees ... unless you opt for an international index fund tracking the MSCI world index. To buy direct shares you need an element of familiarity with the particular international stock market as well as the individual companies that comprise it. While access to information on these markets is becoming much greater, it is not the same as being on the ground in the country in question. Funds can provide the expertise by having representatives in the host countries who are in the position to visit company offices to evaluate company performance. Examples of U.S. international funds include the Dodge Cox International Stock Fund that offers a long-term value investing approach. The International Stock Index Fund (I Fund) has the objective of matching the performance of the MorganStanley Capital International EAFE (Europe, Australasia, Far East) Index. For investors investing on international stock markets whose home country provides dividend imputation,, missing out on franking credits may pose a tax problem. However, domestic companies that have overseas interests may not provide full imputation anyway. Their imputation level, depending on the company, could be as low as 50 per cent. ... and of course investors should be primarily concerned with the quality of the investment itself. Taxation should be a secondary consideration. Another tax issue relates to the treatment of dividends and capital gains. Dividends are generally subject to a withholding tax by the revenue office of the host country. However, your home country will not want to miss out as well. Things are not as bad as they may appear. Most major countries have developed tax treaties to ensure that investors are not hit with double taxation when engaging in international online stock trading. Check here for the list of countries Australia has treaties with ... or check the Tax Office website in your home country. The reality may be that you end up paying no more tax on international share dividends than for local dividends. Capital gains are taxed locally rather than in the host country, and the same rules apply regarding the stock holding period that determines the amount of tax paid. So it comes down to the fact that tax should not be a major concern if considering to invest directly in international share markets. My main concern regarding international stock trading relates to currency fluctuations. If your home currency rises in value against the currency of the host country then any returns will be reduced accordingly. It's one thing picking stocks in another country ... and another thing guessing how the relative currencies will fluctuate. This is why I prefer as a private investor to invest in international share funds (with a value investing approach) that are in a better position to consider whether to hedge against currency movements. Having some international stock in your portfolio provides exposure to some industries that may not be represented on your domestic stock exchange. Because of the difficulty in having 'local knowledge' in the off-shore country, investing in an international mutual or managed fund makes more sense. Taxation complexities and currency fluctuations need to be weighed against the diversification that can be achieved by investing off shore. 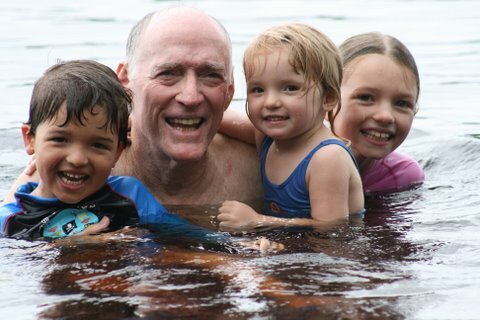 I'm John and these are my grand kids. Welcome to my site. Click here to read my background with value stock investing. I hope you find suggestions in my site that make you a successful value investor.